Frank P. Abbott, born Feb. 19, 1924, Montclair, NJ. 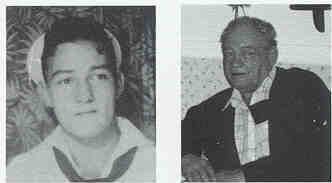 He enlisted in the USN April 10, 1941, and after boot camp was put aboard the USS Yorktown (CV-5) until it was sunk. He was then transferred to the USS West Virginia on June 20, 1942, as salvage crew to clean and remove paint and asbestos. He returned to Bremerton, WA, Navy Yard to rebuild, then returned to sea and combat after she was rebuilt. He was injured on both ships at Midway and the Philippines, put on a hospital ship and sent home. He has all the usual medals and received a citation on the West Virginia for putting out a fire in the torpedo hole. He was discharged Sept. 20, 1945. Met his wife in Bremerton, WA, while serving in the West Virginia, and has four children, eight grandchildren and 12 great-grandchildren. He owned his own hardwood flooring business for 30 years and now lives with his wife Leora in Jacksonville, FL.